On World Homeless Day, Addictions and Mental Health Ontario (AMHO) recognizes the spectrum of services offered by the community mental health & addiction sector that support Alternate Level of Care (ALC) designated people leave hospital and live successfully in the community. ALC designation is given when a patient has completed treatment and no longer requires hospital support, but remain in hospital because they do not have a home to return to with the supports they need. 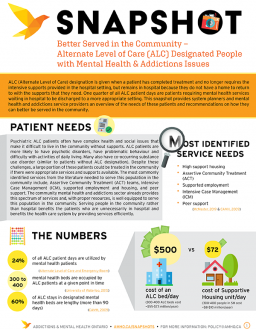 One quarter of ALC patient days in Ontario are patients who are waiting for mental health and addiction services and supports in the community. It costs $72 a day to house someone in the community with mental health and addiction supports, compared to $500 for an ALC bed in the hospital. The province could save up to $65 million a year in hospital spending by investing in supportive housing for ALC patients. Increasing supports in the community benefits the health care system by offering relief to overcrowded hospitals and helping to end hallway healthcare, but more can be done. AMHO’s latest Snapshot – Better Served in the Community – provides recommendations on what’s needed to build capacity to help ALC patients transition home with community-based mental health and addiction supports.